A wide range of electronic sounds, calming instrumentals, and vigorous beats reverberated in IV Theater on Feb. 7, as a crowd of University of California, Santa Barbara students enjoyed musical performances by DJ Psychojohn and Jimmy Tamborello. The show was presented by UCSB’s Magic Lantern Films and Speak Volumes, a local music blog. DJ Psychojohn, a duo composed of Alex Ho, a third-year film and media studies major, and Dylan Chase, fourth-year communication major and editor-in-chief of Speak Volumes, opened up the show with their techno house music. Psychedelic tunes, upbeat tempos, and soulful vocals played throughout the theater as a crowd danced at the stage and grooved in the aisles. The DJ set was paired with film clips that perfectly exemplified the “psycho” in their name. Jason Worden, fourth-year computer science major, customized an eclectic array of images for the DJs; his work brought together colorful animations, cartoon clips, cats morphing into hypnotic diamond patterns, and even wrestling matches. When Ho was asked if there was a particular direction he had in mind for the visuals, he confessed there was no strict plan for the eccentric images. While DJ Psychojohns’ upbeat music allowed the audience to dance along, Tamborello of The Postal Service, also known by his stage name Dntel, charmed the audience by playing a set of calming, electronic songs from different artists he enjoyed, such as Helm, Moon Wheel, and Anenon. Tamborello added his iconic electronic reverberation to create a remix of Enya’s “On Your Shore,” giving the dreamy vocals a modern twist. The result was beautifully ethereal. Tamborello’s chosen songs were accompanied by Hiroshi Teshigahara’s equally serene movie clips. The filmmaker’s tranquil images of beaches, cathedrals, and life in Barcelona were perfectly in sync with the soft, flowing melodies. “We consumed something very beautiful and ethereal tonight,” Chase said. The audience members thoroughly enjoyed DJ Psychojohn’s and Tamborello’s enthralling performances. For some, Tamborello’s music was the perfect backdrop for reminiscing upon nostalgic memories. 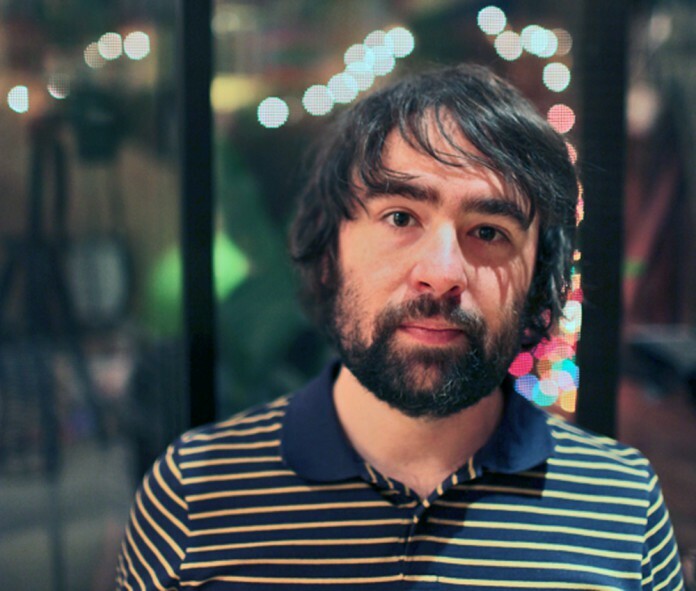 Many know Tamborello as a member of the rock supergroup, The Postal Service. Tamborello and the other two members had their last tour last summer. “It was really fun being able to get back together last summer to do a final tour, and seeing good friends,” reminisced Tamborello. It was humbling to see the world-renowned artist play for a small college community in his hometown of Santa Barbara. As a high school student he had his songs played on UCSB’s radio station, KCSB, as well as at music conventions hosted by local newspaper The Santa Barbara Independent.